Our little man turned five last week, five! 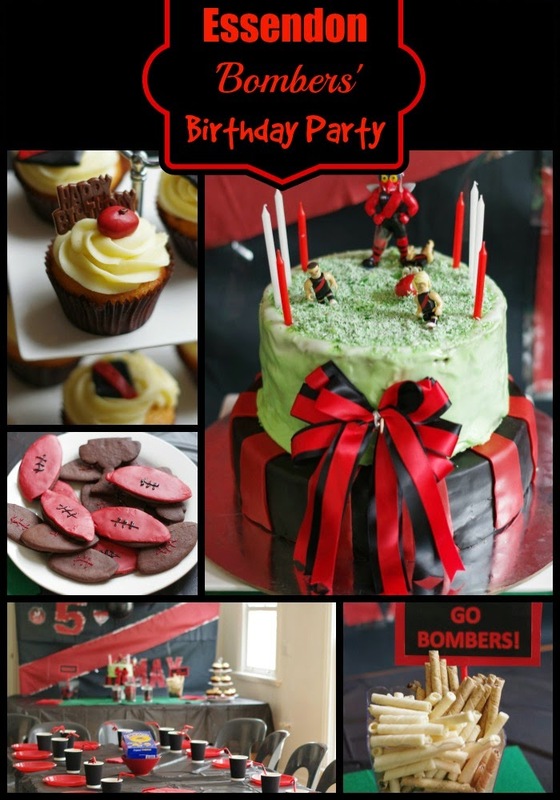 As MJ is a keen Essendon fan we had a Bombers themed footy party - black and red as far as the eye could see! These are the front and back of the invitations I designed on PicMonkey. I printed them as 6x4 photos and glued them together. 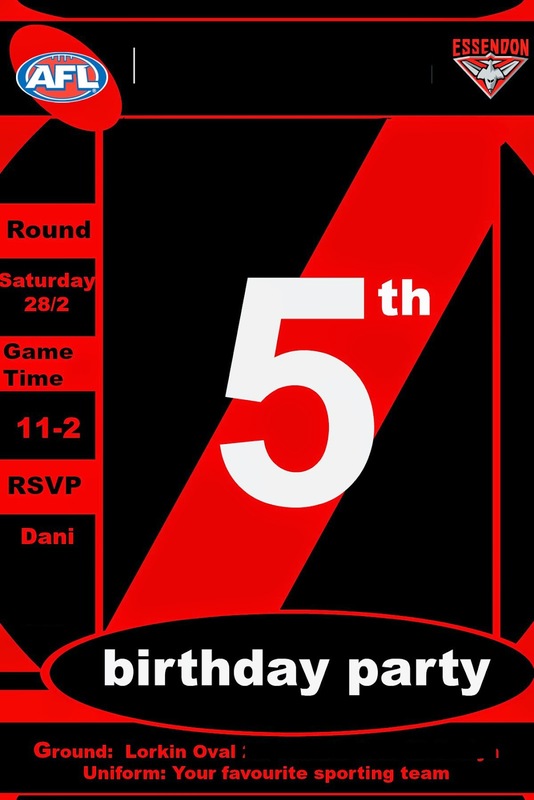 (His name was printed on the top on the actual invites.) I was pretty happy with the way they turned out. I used my trusty, never fail mud cake to make the bottom tier of the birthday cake. The top layer was a three layer cake (chocolate, red butter cake, chocolate.) I think the tiered cake probably looked better at the ganache stage, but it still turned out okay. 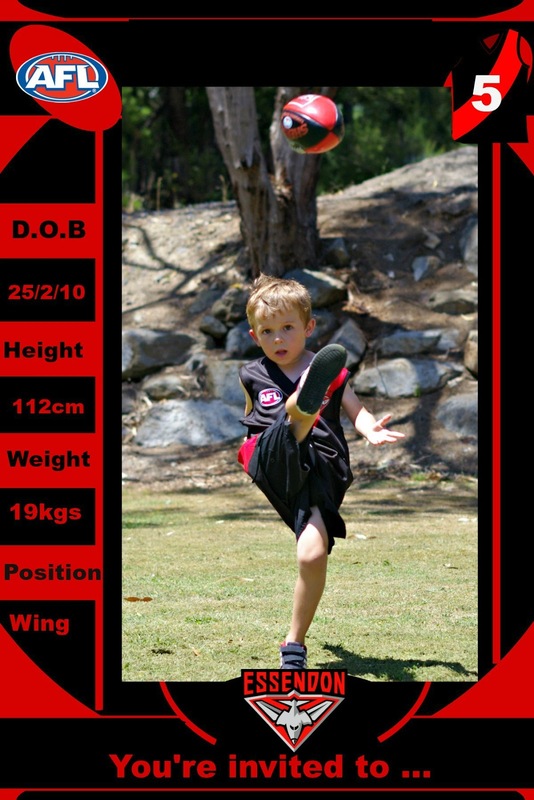 When I was worried about how it was looking, MJ reassured me "Mum, I don't know what you are worried about, it is fine". I would have preferred "it is awesome" but I'll take it! The vanilla cupcakes were topped with cream cheese frosting and decorated with toppers made from left over fondant. I loved the banner I made from some crepe paper - it was $6 and 15 minutes well spent! I also bought a $3 green felt poker mat, turned it over and drew a football oval outline in chalk to add to the football detail. However for all of my efforts focused on food and decorations the highlight was the party games - I loved seeing them all so active and excited! My husband did an amazing job at running the games. I had pulled pork, coleslaw and rolls prepared for the adults and the kids enjoyed traditional party fare (sausage rolls, party pies, home-made pizza, little hot dogs, chicken nuggets.) Other sweet treats included jelly, cake pops, chocolate cookies, fruit and chocolate dipped strawberries. I had intended for the cake pops to look like little football pops but they were pretty big failures in that regard, so in the end they looked like koftas dipped in sprinkles! I also overcooked the cookies and didn't get around to adding the football detail to the strawberries. You can see far more successful attempts at these things on my birthday pinterest board. Other details from the party can be seen in the slide show below. Happy, happy 5th birthday to our little man, we love you to the moon and back! 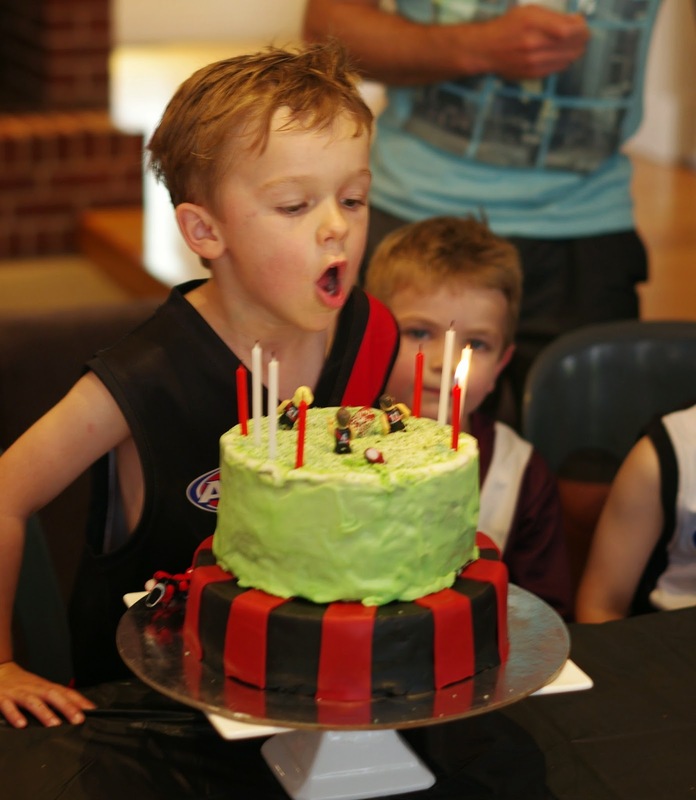 I'd love to hear about your favourite birthday party themes! I love those invitations though. That's such a great idea. Thanks Jess, the invitations were my favourite part. Gotta love picmonkey, it makes us all think we are graphic designers! What an awesome party. That's such a perfect idea.